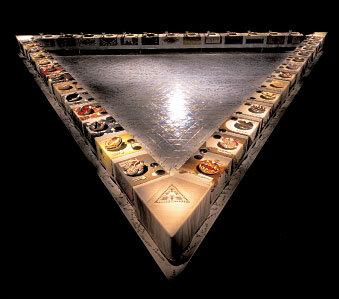 The Dinner Party is an art installation with an enormous triangular table, 48 feet on each side, set for 39 important women from historical figures to goddesses. The table is a significant metaphor in this iconic work of art. 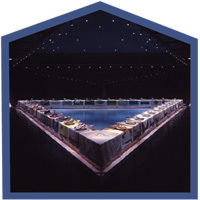 Table Talk, an inquiry based learning activity, introduces students to The Dinner Party through an analysis of visual metaphor focusing on the symbolic meaning of a table. Students consider the various ways tables function in our lives, examine the language we use when talking about tables, and then apply their insights through a closer look at The Dinner Party. The Table Talk activity is one way to introduce The Dinner Party and begin an inquiry into its meanings. As students enter into the work of art through its visual metaphors, they subsequently discover its important ideas. By investigating the artwork from their own knowledge bases and through personal connections, students may be motivated and empowered to learn more about The Dinner Party. The teacher also benefits by considering the students’ cultural experiences and differences in planning further learning activities. To view the entire Encounter, download the PDF for Encounter 1: Table Talk and Classroom Connections: Making Metaphors by clicking on the buttons below.